Remembering the autumn splendor as we climbed a tower in northern Michigan, I made this colorwash rendition of the mountains with a foreground of leaves and the geese flying overhead. Leaves were collected on the trip, pressed into a book, copied at home on a color copier to save the coloration, shape and veins. 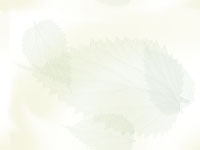 Tracing the leaves on fusible, ironing fusible to the back of dyed fabrics, cutting out, then ironing the leaves on the colorwash background and machine applique were steps in leaf application. By cutting out the leaves carefully, an echo leaf was also cut for placement elsewhere on the quilt. Individual leaves hang over the bottom edge. Some of the flying geese are appliqued while others are foundation pieced. 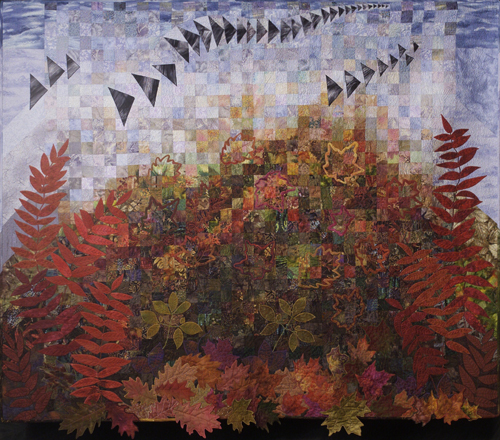 This art quilt hung at Polk County Heritage Gallery and Perry Forest Park Reserve. Original design.